Together, we will journey into the the depths of sound that connect us. Together, we will welcome the sounds that words cannot speak. Together, under the full light of Mama Moon and surrounded by your Star*Seeded Sisterhood, you will be gifted a space to unveil your unique authentic feminine expression. Together, we will gather in richly intentional space to share, dance, play, sing, and laugh. Together, we will travel mystical fae lands and dive into magical ceremony to play with our self- perception of what it means to be alive. With Lady Rainbow, Faerie Godmother and Wild Rose, Medicine Woman as our trusty guides, we will delve deep into the undiscovered country of ourselves and be inspired to allow our creative expression to be unleashed in surprising and unexpected ways. Together, we will immerse ourselves in earth warmed hot springs water and enjoy the rustic and charming hospitality of Mystic Hot Springs. Together, we will surrender ourselves to the melodic musical power of the incredible duo, Leraine Horstmanshoff and Shen. They will take us on a delightful and refreshing journey, beginning with sweet music and singing to bring us into our hearts, gently rising to an ecstatic rock-out crescendo, and returning to the still place within. Delicious catered meals & snacks using farm fresh, organic, and local ingredients. Special diets accommodated by request. To keep our gathering intimate we are limiting the number of ladies that can join the circle. Don't miss this amazing opportunity! 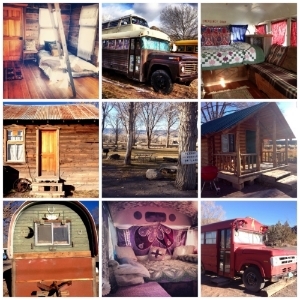 You may upgrade your overnight stay from camping to one of Mystic Hot Springs's Authentic Pioneer Cabins or Hippie Buses with Star Seeded Gathering's special touch. Lady Rainbow and Wild Rose will literally sprinkle you with magic and pamper your senses in a way you've never felt before. From the moment you walk into your cabin or bus, you will totally understand what we are talking about. We will create and hand-select a custom gift basket with items that we just know you will treasure. C'mon...let us spoil you! Cost for your custom upgrade includes Welcome Refreshments, Mystic Cabin or Bus, and Magical Star*Seeded Gift Basket for $75 per person (single occupancy) or $55 per person (double occupancy). Upgrades can only be made by registering for the event online and then by calling the Mystic Hot Springs office at 435-527-3286. Make sure to tell them that you're a participant at the gathering. Call to make your reservation today, there are a limited supply. We so excited for you to receive what we have in store! Mystic Hot Springs is located in scenic Monroe, Utah at 475 East 100 North. Just a few miles off highway 70. Bursting with rustic hippie charm ~ Mystic Hot Springs offers unique lodgings, two soaking pools, seven soaking tubs, and majestic views. Mystic Hot Springs creates an authentic environment which raises self-awareness by direct experience with nature, art, and antiquities. Music is also an essential element at Mystic Hot Springs and since 1995, over 700 bands have graced their stages. Come relax in earth-warmed waters at this one-of-a-kind hot spring resort. Lady Rainbow loves being alive here and now and desires to ignite your internal flame! She thrives on slowing down time by layering each moment with magical essence to delight and inspire your mind, heart, and body. Queen of Mystic Hot Springs, she enjoys leading others to the edge of themselves using nature as the ultimate guide. Wild Rose is a medicine woman by calling, an artist by nature, and a teacher by vocation. She is captivated by the beauty of life and now, and is delighted when she can enhance and share that beauty. Rose takes great pleasure in being curious, exploring the planet and creating art. She facilitates art medicine journeys based on cultural storytelling. Leraine Horstmanshoff is a world-renowned musician and vibrational sound healer. Her natural ability to create connection and clarity, through the pure tone of each instrument, carries listeners deep into the dream/ journey. Her voice brings in an element of the Divine feminine that promotes healing and trust, guiding people to find the spirit in their own voice. She is a believer in the healing power of love and gratitude and her heart is her guide. She has had the honor to work with shamama Marcela Lobos at various retreats in Joshua Tree and Chile and has shared the stage with devotional artists, Deva Premal and Snatum Kaur. Jenniffer Poitra is of Ojibwa and Shoshoni decent and is a certified teacher of yoga, Usui and Karuna Reiki. Her heritage teaches to honor all life and that we are blessed by our loving Creator, for the benefit of all our relations. Initiated in various healing modalities and traditional ceremonies, her skill as an energy healer shines through in her intuitive way. Through her loving care, she creates an opportunity for each individual to tune into their body, mind and spirit, and move from their unique, authentic body intelligence to create holistic healing. She is devoted to bringing Conscious Love, Light and Healing into each moment of this beautiful life’s journey through living the Dream.